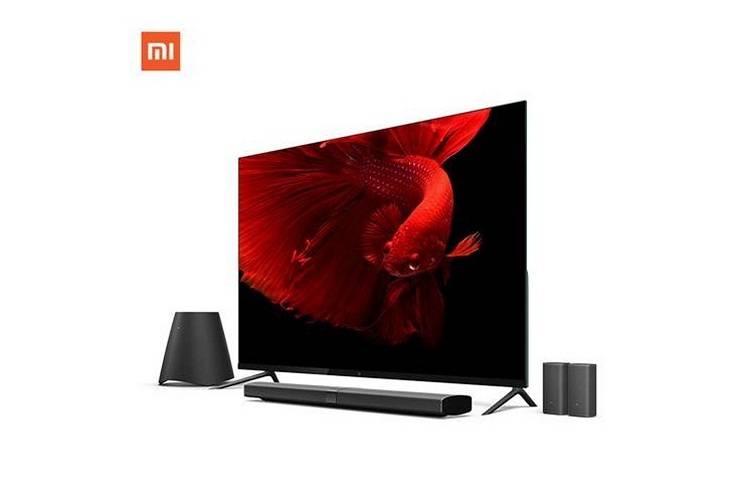 Besides making a big splash with the Redmi Note 5 and the Redmi Note 5 Pro smartphones, as expected, Xiaomi also unveiled the Mi TV 4, making India the first international market to get the company’s smart TVs, which were thus far restricted to China. The 55-inch model will be sold in India to start with, and it’s not known whether the 49 and 65-inch offerings will also be launched in India at a later date. 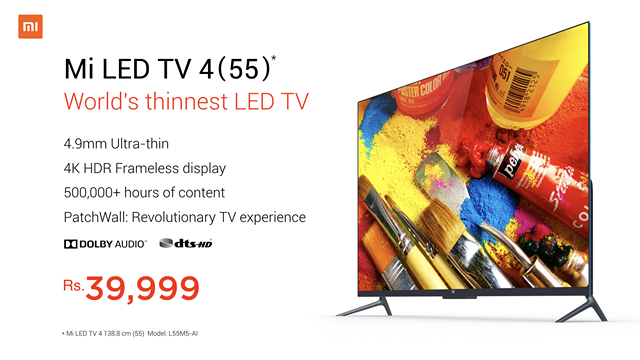 Coming to the price and availability, the Mi TV 4 (55) is priced at ₹39,999, and will go on sale via Mi.com, Mi Home stores, and Flipkart starting February 22. The Mi TV 4 (55-inch) being launched in India features either Samsung or LG 4K display panels that come with a resolution of 3840×2160 pixels, has a frameless design, and measures just 4.9 mm in thickness, making it 30 percent thinner than the iPhone 7. The company claims that it is “the world’s thinnest LED TV”. There’s also a Mi TV Bar that comes with 10 speakers, 2 wireless rear satellite speakers and a subwoofer. The TV supports Dolby Atmos audio technology with 2 up-firing speakers that the company claims will offer “an immersive 3D sound experience”. The Mi TV is powered by an Amlogic SoC that comes with an integrated Cortex-A53 quad-core CPU clocked at 1.8GHz coupled with a Mali-T830 GPU. In terms of software, the Mi TV 4 comes with a whole bunch of pre-loaded apps, including, but not limited to, Hotstar, Voot, Sony Liv, Hungama Play and Zee 5, most of which will be free to access. The television also comes with a modular design that will allow it to be easily upgraded in the future. The device also comes with a ‘transparent’ stand, and features a proprietary cable connection dubbed ‘Mi Port’ that can connect Mi TV Bar to the display. There are also a bunch of accessories to go along with the actual TV set, including the Mi IR cable, which comes with a ₹299 price-tag, but will be given out for free during the first three months. The company is also offering free installation – normally priced at ₹1,099 – with the TV during the first three months after release. Early birds can also grab free 3-month subscriptions for Sony Liv and Hungama Play.